Apollo picked up his first pentakill in the game as well. Everything came down to the final day of the regular season. 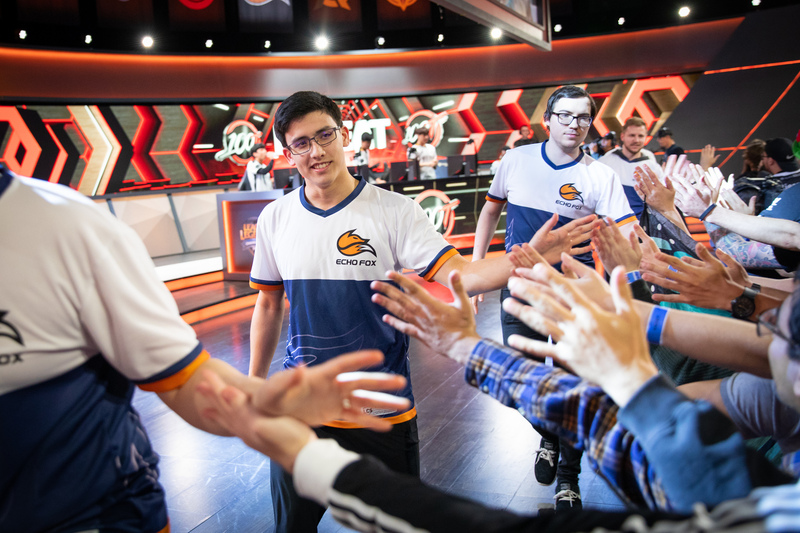 For Echo Fox, it started with an upset yesterday over Team Liquid—the No. 1 team in North America. Today, Echo Fox faced CLG, a team that shared its 7-10 record. For both teams, a win would mean a postseason berth, but a loss would result in being eliminated from the 2019 LCS Spring Split. The game started with a jungle invade by CLG, which resulted in first blood for Raymond “Wiggily” Griffin. The invade set the tempo for an aggressive game between both teams. CLG entered the matchup with heavy damage thanks to a Zoe mid lane sandwiched between Darshan Upadhyaya’s Neeko pick in the top lane and a Lucian. Despite being down by a pair of kills, CLG came out of the early game with a sizable gold lead over Echo Fox. Although Echo Fox entered the mid game down 4,000 gold, the team held a 5-3 kill advantage over CLG. With a team composition heavily favored in hard engages with champions like Morgana, Vladimir, and Sejuani, Echo Fox forced a teamfight in the mid lane after catching out Tristian “PowerOfEvil” Schrage. The fight resulted in a triple kill for Apollo Price, a second Infernal Drake for Echo Fox, and a reversed gold lead. Now with all momentum, Echo Fox never let up the pressure on CLG. Echo Fox slowly choked out CLG’s vision across the map, making a play around the Baron pit far more difficult. It never came down to a game-deciding fight over Baron, however, as Echo Fox picked off four CLG players in the jungle before taking Baron to close out the game. In the final fight over CLG’s Nexus, Apollo earned his first pentakill in the LCS aided by a fountain dive by Echo Fox. With the victory, Echo Fox claimed the final spot in the postseason as the sixth seed. This is the fourth consecutive time Echo Fox has qualified for the playoffs dating back to last year. The team’s run toward a first-place finish begins with a best-of-five series against TSM in the first round of the playoffs.